While bell peppers are a very popular vegetable, they have not always shared the health research spotlight with other members of the pepper family due to their very minimal content of the phytonutrient capsaicin, the well-researched pepper compound that gives hot peppers their "heat." Once active in the body, capsaicin can bind onto nerve cell receptors and change pain sensation, and it may also have important anti-cancer and blood-sugar balancing properties. However, the lack of "heat" or significant amounts of capsaicin in bell peppers does not mean that this vegetable should be denied the health research spotlight! The actual nutrient and phytonutrient content of bell peppers is impressive - and also somewhat surprising given the very low-fat nature of this vegetable (some nutrients and phtyonutrients are fat-soluble and hence for them to be present the food needs to contain some fat). There is far less than 1 gram of total fat in one cup of sliced bell pepper. However, this very small amount of fat is enough to provide a reliable storage spot for bell pepper's fat-soluble nutrients, including its fat-soluble carotenoids and vitamin E. Bell pepper is a very good source of vitamin E at about 1.45 milligrams per cup, and it contains more than 30 different carotenoids, including excellent amounts of beta-carotene and zeaxanthin. Both of these carotenoids provide antioxidant and anti-inflammatory health benefits. I think roasting vegetables really brings the flavor out of them. And the smoked sausage just takes them over the top, a lot of flavor. I didn't peel the potatoes, but you could, if desired. 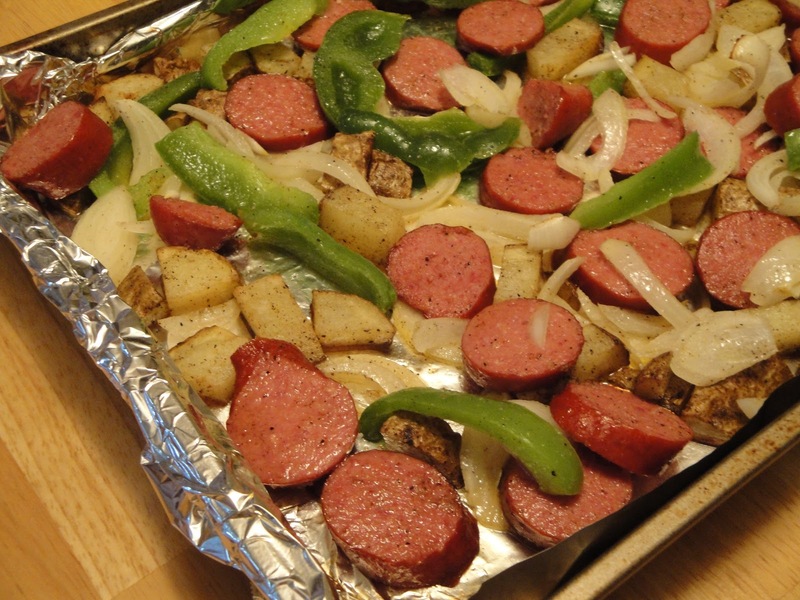 Line sheet pan with tin foil, lightly spray with nonstick cooking spary. Place potatoes on sheet pan, drizzle olive oil, salt, pepper and garlic powder, toss well. Place in oven, cook for 15 minutes. Remove from oven, top with sausage, onions and bell pepper, sprinkle salt, pepper and garlic powder, toss well. Cook another 10 minutes. Enjoy! Mmm... I bet the cranberries are really good in this one! I love the simplicity of this dish and would eat this everyday. I love peppers and don't use them often as my hubby hates them. Looks great! What a delicious lucky meal! Simple and quite tasty I'm sure! Yum, you can never go wrong with sausage and peppers! Hi Christine, I've been following your blog for a few months now, and love your recipes. I also like the kitchen chew. Not only do I get good recipes when I visit but I also learn some every time. I would love to have all your recipes in one spot. Do you have a cookbook, if yes where can I buy your cookbook and how much does it cost? Thanks and keep up the good work. Hi Sara, I don't have a cookbook. Thank you! I will bet the house smelled fantastic while this was cooking! Very filling meal. What a great week night meal.